Recorded live at SWF Jazz Sessions Pirmasens, November 13, 1959 (Tracks 1-6) & SDR Treffpunkt Jazz Stuttgart, September 20, 1960. 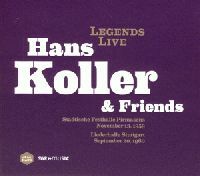 At a time when jazz in Germany was still something of a protected species, Viennese-born Hans Koller arrived on the scene with all the electrical energy of a thunderstorm. He had wanted nothing more than to own and play a saxophone since childhood, and when his parents eventually capitulated, the young Hans was left to embark on the life of a musician. That was 1930s Vienna. Then came the Second World War – and with it the GIs. Hardly a night went by without Koller playing the American clubs. In 1950 he moved to Munich, but German boys still lacked experience in the swing and bop genre. Then suddenly: radio broadcasts, fi rst recordings, a quartet with Jutta Hipp, and fi ve stars from Downbeat in 1953 with Albert Mangelsdorff’s quintet; and ultimately a tour with Dizzy Gillespie, followed by a lengthy collaboration with Oscar Pettiford. It has become trite to compare every tenorist who plays with above-average energy and dynamics with Trane. But if there is one contemporary who assumed the style, tempo, phrasing, gravitas (if not the ferocity) of the big, black musician from Hamlet, North Carolina, without ever becoming a carbon copy, then it is “Sound Koller”, as Albert Mangelsdorff liked to refer to him. To round off the magical year of jazz that was 1959, Sound Koller teamed up in the Palatinate town of Pirmasens with an equally passionate Martial Solal, recently arrived from Paris with Roger Guérin (tp) and Michel de Villers (bs). What unfolded was a memorable SWF Jazz Session, full of the tension and excitement only a live performance can generate. These young men put their individual skills on display with a confi dent nod to colleagues overseas, where that same year Miles with Trane, Brubeck with Desmond and Coleman with his quartet had already demonstrated the “Shape of Jazz to Come”. The 1960s had arrived by the time these discs were spinning in Germany. And Koller had long since branched out with a very different group of musicians, establishing his credentials as both composer and arranger with his “brass ensemble” in Treffpunkt Jazz Stuttgart.